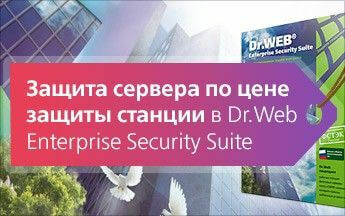 Russian anti-virus company Doctor Web has changed its license prices for Dr.Web Server Security Suite: starting October 1, when customers purchase Dr.Web server software to protect 9 or more machines, the cost of protecting each server will equal the cost of protecting one PC. For 1-8 servers, the regular price applies (but the more servers protected, the lower the license price will be for each of them). However, when renewing or making an additional purchase, even if just a single server is involved, the license price will also equal the cost of protecting one PC, provided that the total number of servers protected is greater than 8. The server anti-virus software Dr.Web Server Security Suite is supplied with Dr.Web Enterprise Security Suite, Dr.Web Office Shield appliances, and the Dr.Web Universal and Dr.Web Safe School bundles.